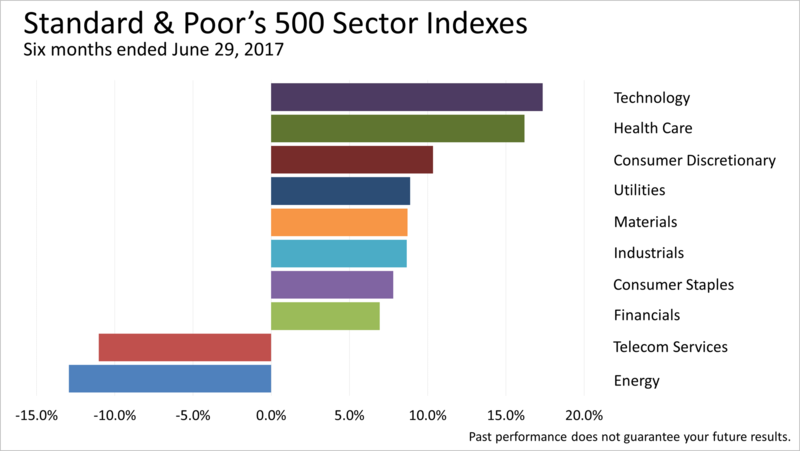 The first half of 2017 was a fantastic period for U.S. stocks, which are key to growth of capital in broadly diversified portfolios invested for the long run. Stocks posted a 2.9% gain in the second quarter of 2017 following a 6.1% gain in the first quarter. This followed a return of 3.8% in the fourth quarter of 2016, 3.9% in the third quarter of 2016, and 2.5% in the quarter before that. America's 500 largest publicly-held companies have averaged about 10% annually since 1926, making the 9.2% total return in the six months ended June 29, 2017 an exceptionally strong start to the year. 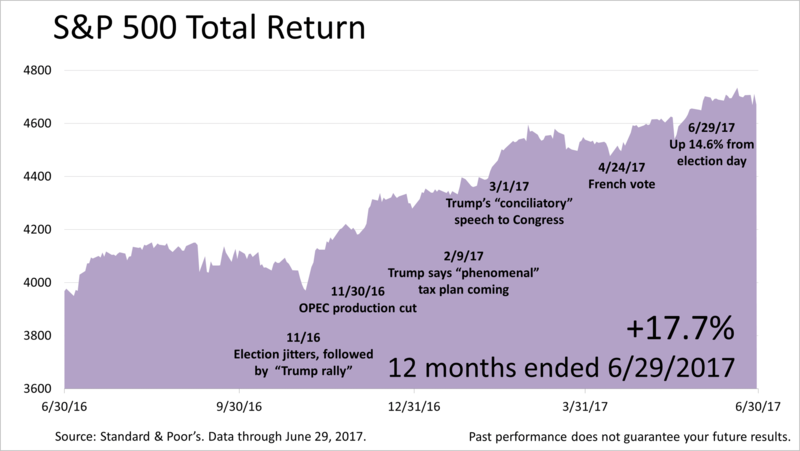 The first half of 2017 continued the "Trump rally" that began in the fourth quarter of 2016, with one significant change. While the stock market rally initially was driven by the promise of a major tax cut and slashing of regulations governing business, the stalemate over health care reform, which was expected to finance the tax cuts, dashed hopes of lower corporate and personal taxes. However, a steady flow of strong economic and corporate earnings reports instead drove stocks to new highs repeatedly in recent months. After abandoning the "FANG" stocks - Facebook, Amazon, Netflix and Google - in late 2016, technology stocks surged once more. They gained more than 17% in the first half of the year. After President Trump's campaign statements in late 2016 about reining the rising medical expenses caused health care stocks to slump, the industry segment, which accounts for one-sixth of the nation's gross domestic product, rebounded sharply and gained 16.2%. The energy sector lost ground as oil prices traded down on rising energy inventories and the rising U.S. rig count and production. Over the last couple of years, the energy industry, which is dominated by oil company stocks, has suffered because oil prices have remained relatively lower than they had been in recent years. American oil production has become more efficient and more U.S. oil rigs are able to operate even as the average price of a barrel of oil has stayed below $50. That's a very positive story for the long run for the U.S. economy. Utilities performed surprisingly strong, as bond yields were expected to rise sharply in 2017 but did not. 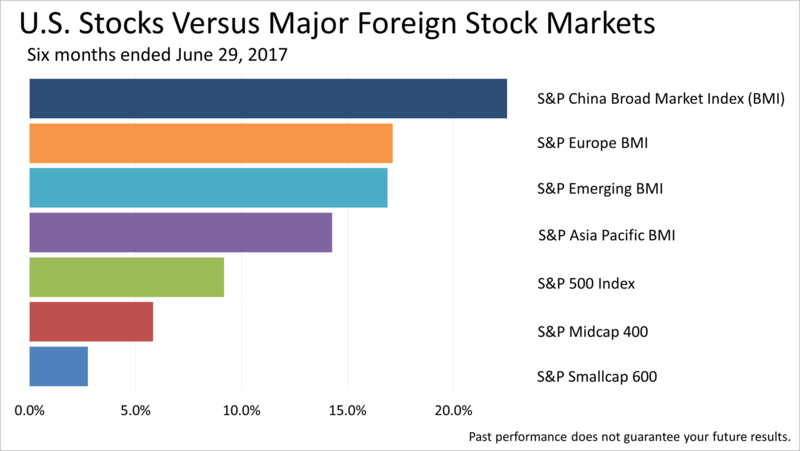 In a complete reversal from the fourth quarter of last year, China, Europe, Emerging Markets and Asia Pacific, for the six months ended June 29, 2017, all outperformed the U.S. indices. Also staging a comeback, S&P 500 large-caps beat mid- and small-caps. 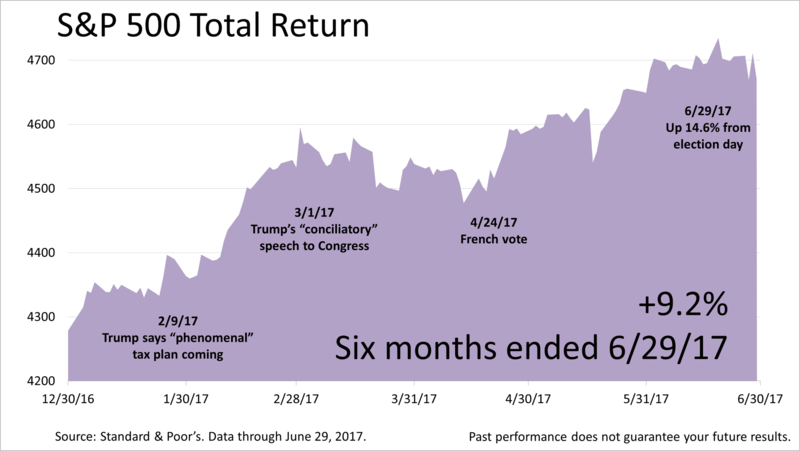 In the six months ended June 29, 2017, stock markets all around the world rallied strongly, with the S&P Global Index Excluding U.S. Stocks gaining 15.3%. 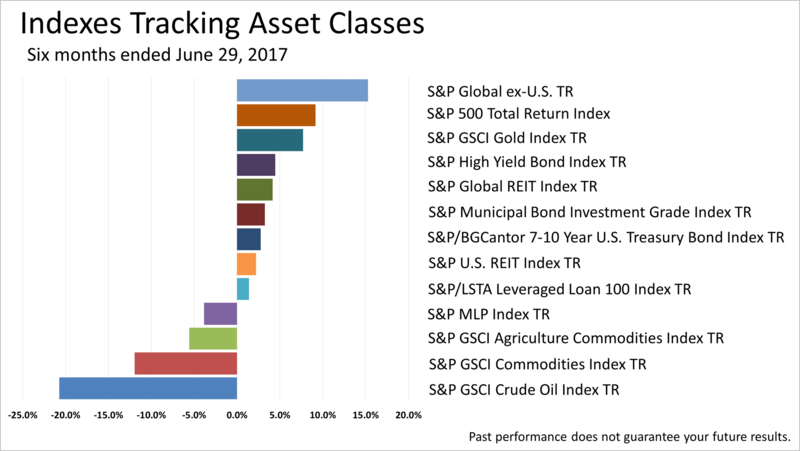 Non-U.S. markets beat the U.S., and stocks were the best-performing among all 13 of the asset classes tracked regularly. Foreign economies posted improving economic data and were catching up with the U.S.'s fourth quarter "Trump rally." Gold rallied, reversing its fourth quarter slump on U.S. dollar strength. Oil, Master Limited Partnerships, and Commodities all posted losses. Stocks gained a strong 17.7% over the 12 months ended June 29, 2017, as S&P 500 earnings recovered from last year's collapse in profits in energy and mining. Stocks rallied in the third quarter of 2016 on a surprisingly strong July jobs report, and then the S&P 500 flattened through September's end. The rally resumed in the fourth quarter and continued in the first quarter of 2017, on the Trump election win, OPEC's announced production cut, strong economic growth of 3.5% in the third quarter, and a stream of better-than-expected economic news. The second quarter 2017 stock market gain came gradually, as first quarter GDP growth came in at just 1.2%. However, investors have looked past the first quarter figure because a strong pickup is expected in the economy during the remaining three quarters to be reported on in 2017. First quarter 2017 earnings came in very strong and well ahead of expectations. 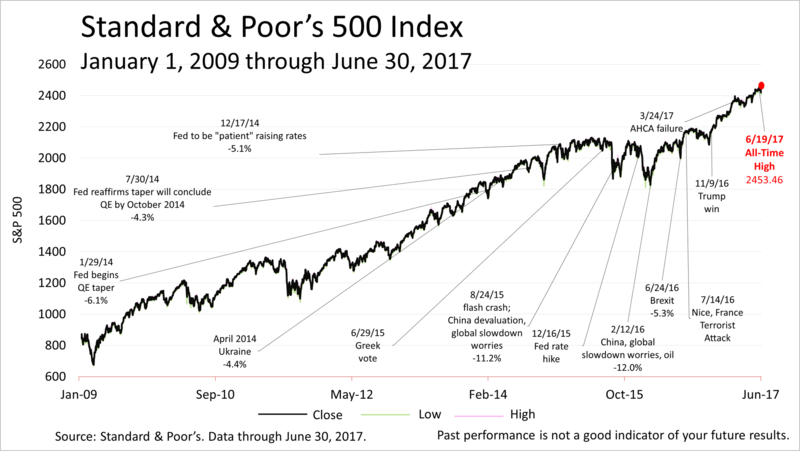 The Standard & Poor's 500 index closed the second quarter on Friday at 2423.41, about 1% off its all-time high hit just 10 days earlier. A correction of 10% or 15% could come at any time, simply because of a change in sentiment or unexpected negative news. However, the outlook for the fundamentals that drive stock prices - corporate earnings, consumer spending and inflation - remains bright for the rest of 2017 and 2018. That means stocks could continue to rise in the months ahead if things go as expected without any bad surprises.